Of all kind of fishing, the best one surely is trophy fishing! 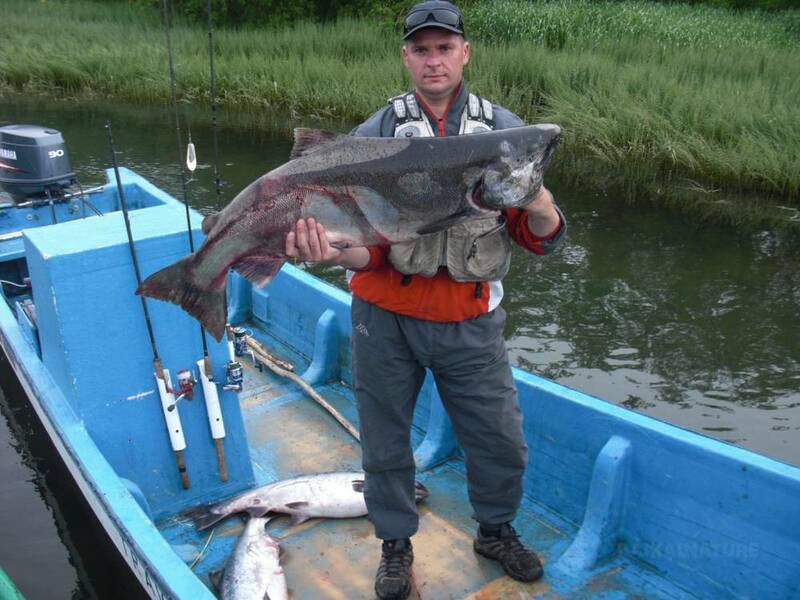 Go on a one week fishing trip to one of the most beautiful places of all Russia: the River Bolshaya at the junction of the Rivers Bytraya and Plotkova in the center of the Kamchatka Territory. The River Bolshaya is accessible, full of fish and, most of all, holds a treasure. 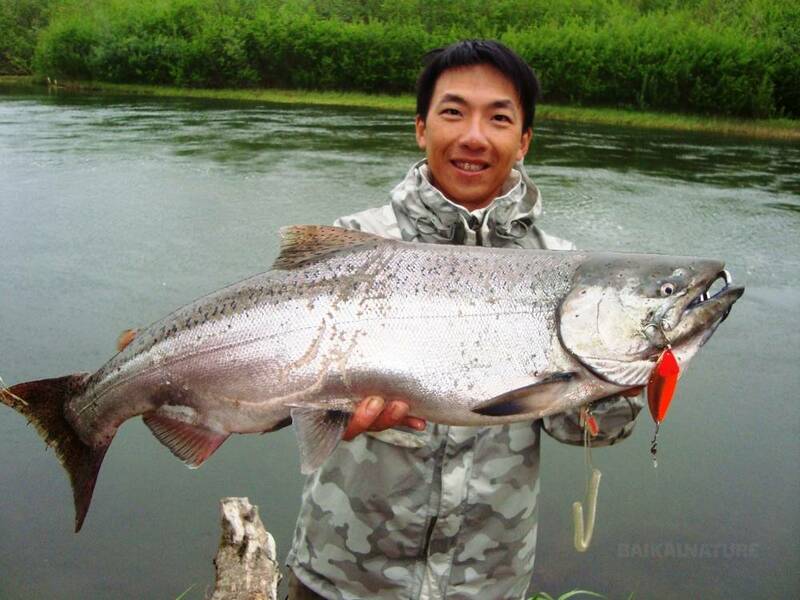 A trophy fish that every angler dreams to reel: the Chinook Salmon, also called King Salmon. It can be more than 180 centimeters long (6 feet) and weigh about 40 kilograms (90 pounds). 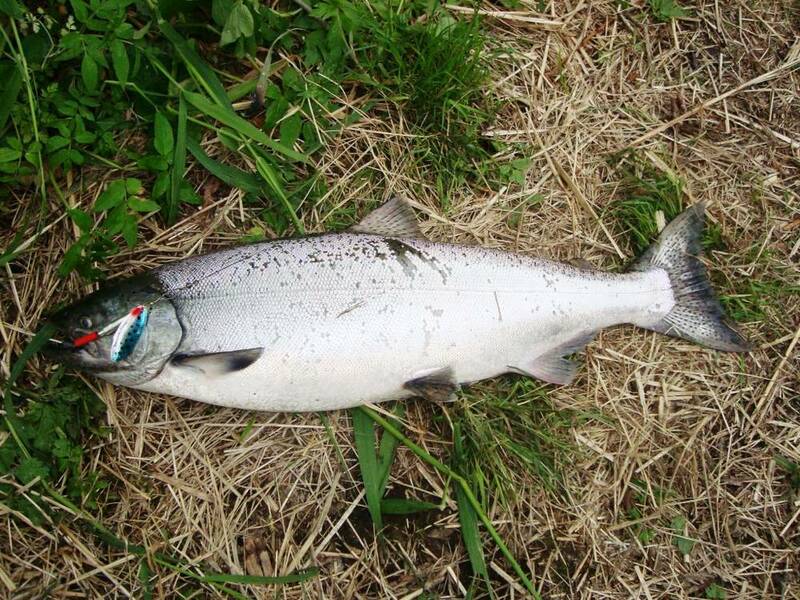 Whether you are a beginner or an advanced angler, this fishing trip will suit you well. Our seasoned guides will help you take to this activity that tends to be a bit of a gamble at times. And if you wish to try your hand at a professional level, a contest for the best angler – or for the luckiest! – will be hold. But you can be sure of one thing – this fishing trip won’t let anybody down without a catch! Throughout this trip, you’ll experience all the aspects of Russian fishing. In the evening you’ll rest in the wooden houses of the fishing village and relax in Russian banyas. 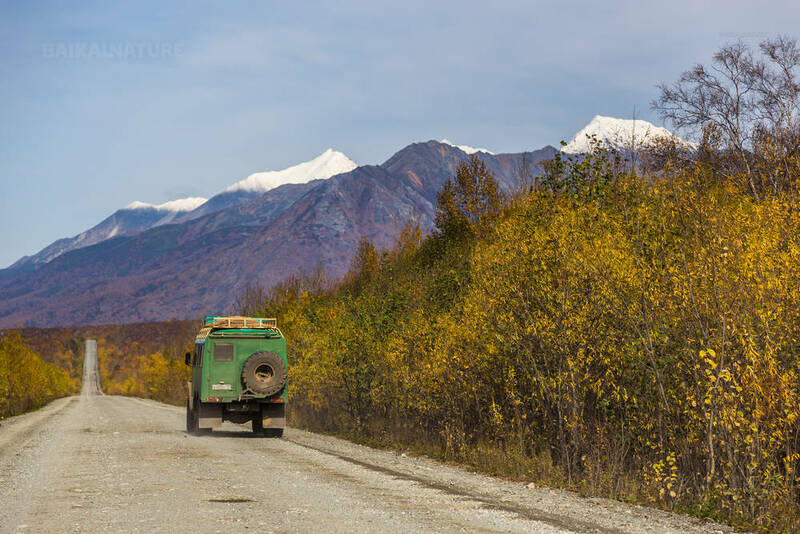 Get ready to visit one of the most beautiful places of all Russia and become a salmon fishing enthusiast! On arrival, your driver and your guide welcome you and check-up for your equipment. If you do not have one or if it’s incomplete you can buy what you need on your way to the River Bolshaya. Have lunch in a café by the road (not included, payable in cash on site). See the River Bolshaya for the first time. Check into your resort (2-3 persons per room). 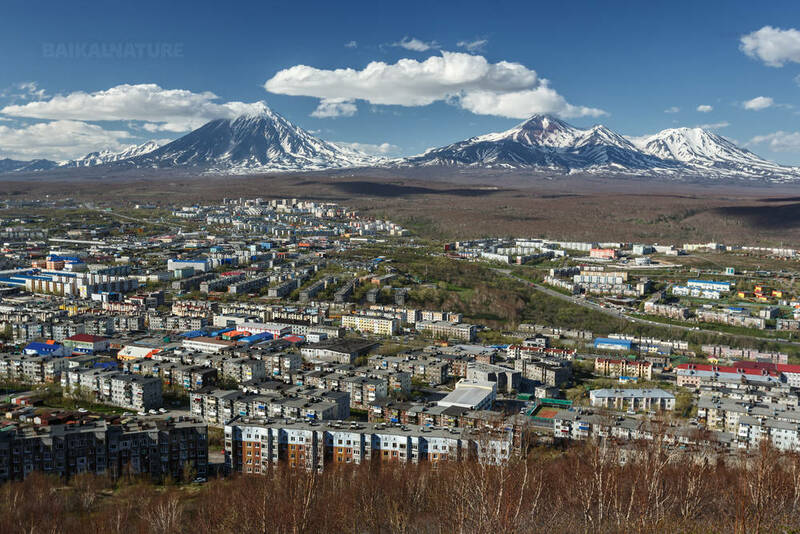 The River Bolshaya is situated in the center of the Kamchatka Peninsula, on the western coast. It is formed by the junction of the Rivers Bystraya and Plotnikova. It is accessible and full of fish. Motor to the main course of the river and enjoy fishing from the boat. Even if you’ve never fished before, you’re sure to reel a beautiful catch. In the River Bolshaya you can find many different sorts of fish: Chinook (King) Salmon, Red (Sockeye) Salmon, Pink (Humpback) Salmon, Coho Salmon, Stone Loach, Thumallus and many others. Either picnic on the boat or have lunch at your resort when you return. Have dinner by the fireplace and share your daily experience with the others. Most anglers come all the way to the River Bolshaya in search for the trophy fish, Chinook Salmon, also called King Salmon. In Kamchatka, they’re sometimes more than 180 centimeters long (6 feet). During this 3 day fishing trip, organize a contest for the largest reel. Choose a fishing spot on your own or follow your guide’s advice. Travel to Paratunka Village and its 106°C hot springs (223°F). Its first spa resort was opened in 1946. People go there not only for healing but also to take some rest away for the hustle and bustle of the city. Have lunch in a café your way to Paratunka (not included, payable in cash on site). Arrive Paratunka Village and check into your resort. Have some leisure time to rest, bathe into the hot springs, enjoy the banya or the swimming pool or go to the restaurant. Spend your day as you wish it. You can subscribe to either of those two options at extra cost payable in cash on site. First option: Fly in a helicopter down to the bottom of the Geysers Valley. 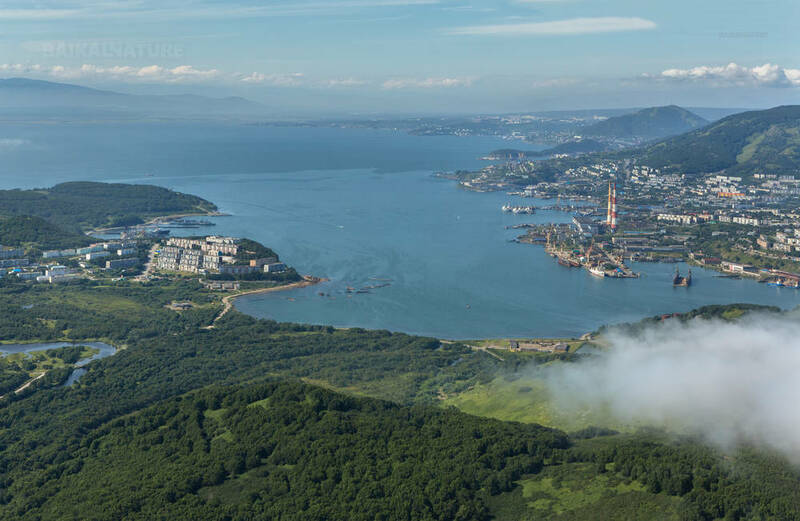 You can add an extra to this option and visit the Uzon Caldera. Fly around the Karymsky volcanoes (1486m) and Maly Semyachik (1560m), hike through the valley and a bathe in Zhupanovsky springs. Enjoy gazing upon the 20 great geysers: Velican (Giant), Zhemchuzhny (Pearly), Sakharny (Sugary), Troinoi (Triple), Konus (Cone), Fontan (Fountain), Maly (Small), Bolshoy (Big), Shchel (Split)… Some of them will erupt every 10-12 minutes, others every 4-5 hours. Your eyes shall never forget the sight of the steam jets, the boiling water fountains, the incredible colors of the luxuriant slopes running with boiling water. Second option: Board your cruise for a 5-6 hour long boat tour of Avacha Bay. Fish, watch the seabirds, see Babushkin Kamen Island and the Three Brothers Rock and set foot on the Starichkov Island in the Pacific Ocean. 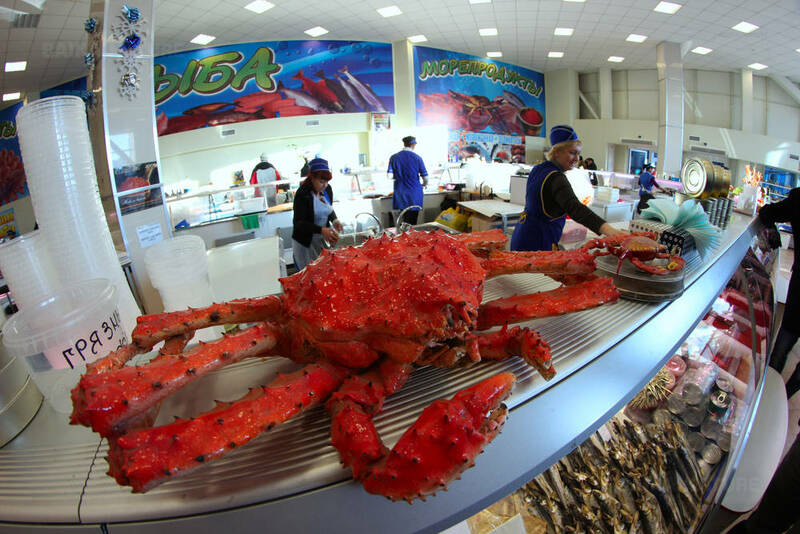 Checkout your hotel and visit the fish-market and souvenir shop. Transfer to the airport for your flight. Single supplement for an overnight in the hotel - 7 000 roubles. Equipment rent (spinning with fishing reel, without spinner) - 1 120 roubles / for 1 day. The price is fixed and won't changed according to the group's size. During the fishing there will be 2 persons in the boat. The tour dates can be changed according to your suggestions. Please, take with you the waders or wading boots.